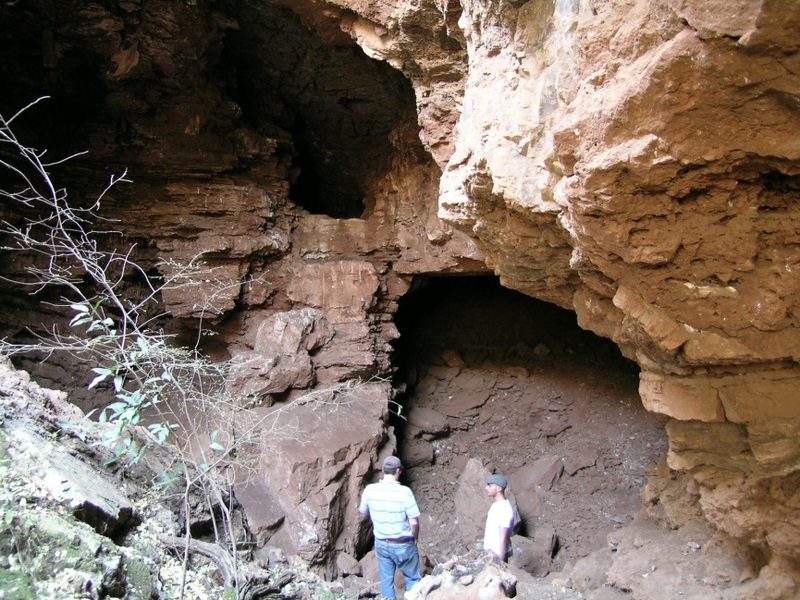 Haasgat is a largely intact South African palaeocave system with a unique combination of fossiliferous early Pleistocene (~2.3-1.95 million year old [Ma]) in situ sediments and a rich ex situ sample of extinct primates and mammals. The Haasgat fossil deposits were first noted in 1987 and led to limited geological description and faunal analysis (the Haasgat Dumpsite [HGD] assemblage) of mechanically processed fossils from ex situ mining rubble (Keyser and Martini, 1991; Plug and Keyser, 1994). Like most other Plio-Pleistocene South African cave sites, commercial mining altered the Haasgat palaeocave system; however, the site is unique in that the ~100m mined tunnel retains much of the original palaeocave including undisturbed columns and bands of fossil-bearing calcified sediments and flowstones along the walls and ceiling (Keyser and Martini, 1991). The focus of this early research was primarily on the rich samples of the relatively rare extinct primates Papio angusticeps and Cercopithecoides williamsi (McKee and Keyser, 1994); the latter recently proposed to represent a novel species, Cercopithecoides haasgati (McKee et al., 2011). Despite the significance for South African palaeontology evidenced in these early publications, excavation ended in the 1990s without in situ excavation and only preliminary results published (citations above; Plug and Keyser, 1994). Both the Haasgat site and faunal assemblage remained largely unstudied until our recent research at the locality in 2010. With the generous support of the Tetley and Fleischer families, the Kalkheuvel West community, the South African Heritage Resource Administration (SAHRA), and the National Science Foundation (BCS 0962564) our team reopened Haasgat for a modern phase of geological and palaeontological research. Specimens from the Haasgat HGD assemblage described in Adams (2012). Clockwise from the top left: A partial maxilla of the extinct Bond’s gazelle Antidorcas bondi; partial cranium of an extinct klipspringer, Oreotragus sp. ; a partial cranium of a porcupine, Hystrix africaeaustralis; a fourth metatarsal of the extinct false sabretooth cat Dinofelis sp. Comprehensive geological survey and establishing a chronological framework for interpreting the depositional history of the in situ fossil deposits and context for the ex situ derived HGD faunal assemblage. This research phase has provided the first magnetobiostratigraphic date for the Haasgat fossil faunas of between 2.3-1.95 Ma, and our novel application of X-ray fluorescence microscopy demonstrated strong arsenic signals within the flowstone samples, indicating wet environments within the palaeocave and surrounding landscape during faunal deposition (Herries et al., 2014). 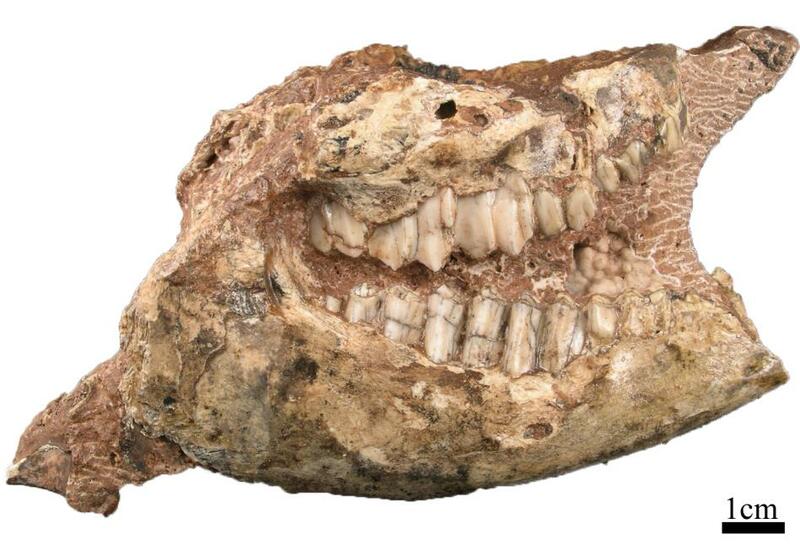 Equally important is that this survey led to the discovery of Cercopithecoidesand Papio angusticeps craniodental and postcranial remains in the in situ depositional sequence. This provides an in situ depositional and chronological context for the ex situ primates, as well as a framework for starting the first in situ excavations at the site. Complete reassessment of the pre-existing Haasgat HGD faunal assemblage. This was ultimately a protracted process because nearly half of the originally processed HGD fossils were never included within prior faunal descriptions, including dozens of primate specimens (Kegley et al., 2011, in review; Adams, 2012). 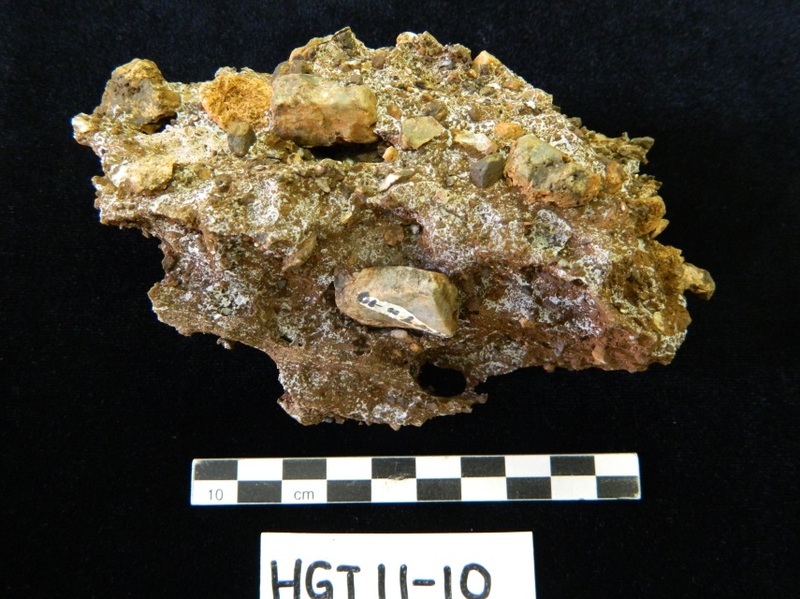 The Haasgat HGD catalog included no notations of specimen associations essential for referring the sample to the in situ deposits, and ultimately most of the cataloged and/or published specimen identifications had to be revised (Kegley et al., 2011, in review; Adams, 2012). Inspection of the fossils revealed that mechanical processing had produced an overprint of damage that severely limits confident taphonomic interpretation of this first sample, and the substantially altered species list rendered prior biochronological and palaeoecological interpretations of the site invalid (Adams, 2012). particularly given the newly identified primate specimens from our reanalysis and the large and unique nature of the previously identified colobine (Cercopithecoideshaasgati; McKee et al., 2011) and papionin (Papio angusticeps; McKee and Keyser, 1994) samples. Our reassessment of the Haasgat primates began with detailed intra- and interspecific metric and morphological data on the Cercopithecoidescraniodental remains (Kegley et al., 2011; Adams, 2012), that was expanded to include 3D geometric morphometrics of both the Haasgat and greater South African colobine record (Kegley et al., in review). The first palaeoecological and palaeodietary investigation of P. angusticeps and Cercopithecoideshaasgati via stable carbon and oxygen isotopes (Adams et al., 2013). 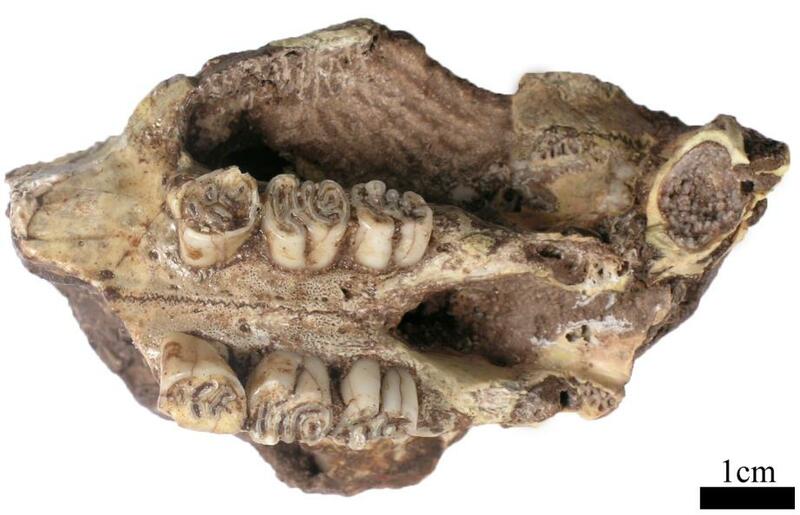 A key finding of this study was that the range of P. angusticeps δ13Cenamel values exceeds that of previously sampled fossil baboons, with several individuals exhibiting strongly C3 dominant diets. This suggests either the species had a highly individually variable diet, the sample is time averaged and local ecosystems changed during primate deposition, or that further analysis might (as with the colobines) reveal that there is more than one species within the HGD “P. angusticeps” sample. 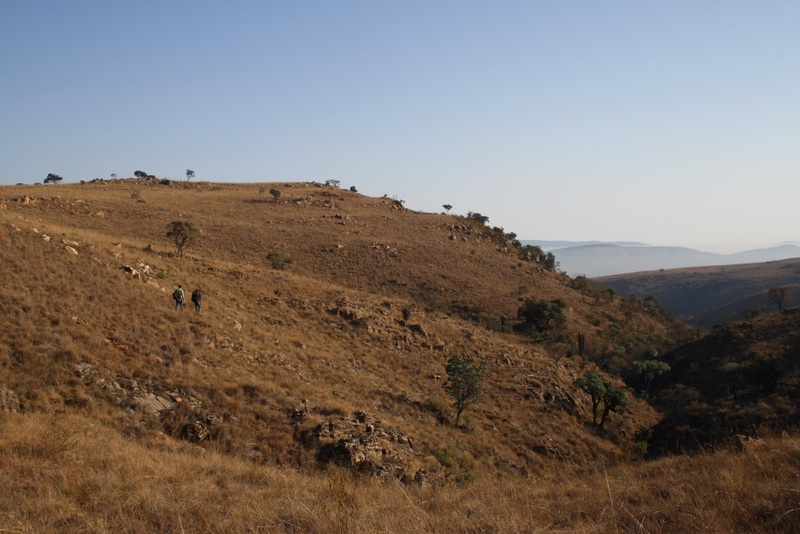 While the results of these first studies have only touched on aspects of the Haasgat primate palaeobiology, they have already reinforced the potential of the Haasgat locality for South African palaeoprimatology. 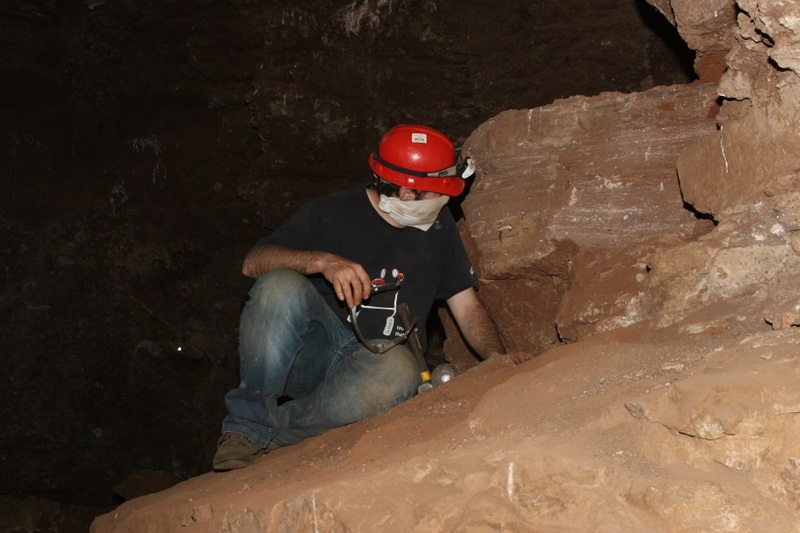 Undertake the first excavations of the Haasgat calcified in situ sediments. Is the previously described ex situ faunal assemblage an accurate reflection (e.g., in species and/or element representation and diversity) of the fossil assemblages that originally formed at Haasgat? Which of the Haasgat primate and mammal species were contemporaneously deposited and therefore suitable for reconstructing the early Pleistocene palaeoecology of the Haasgat site and region? What taphonomic processes mitigated the deposition of the primates and mammals in the system? Analyze the ex situ sample of primate postcrania. 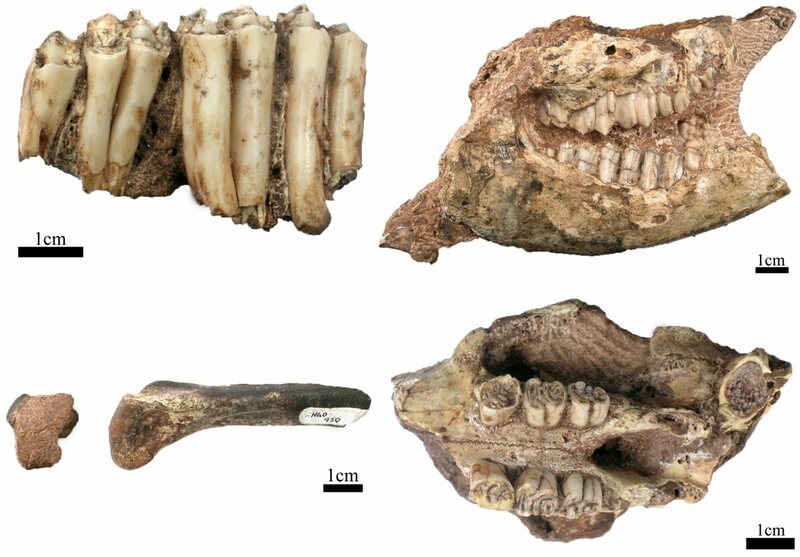 What are the taxonomic affiliations of the Haasgat primate postcranial remains? Can the results of 3DGM analysis of the primate postcrania provide data for both biobehavioral interpretations of these extinct species and more accurate interpretations of Haasgat palaeoecology? We are currently working on analyses from data collected in 2014, and will continue our data collection and hypothesis testing through 2015. Pending acceptance we should be presenting initial results at the 2015 American Association of Physical Anthropology Meetings and providing further updates on our research! Kegley ADT, Hemingway J, and Adams JW. In review. 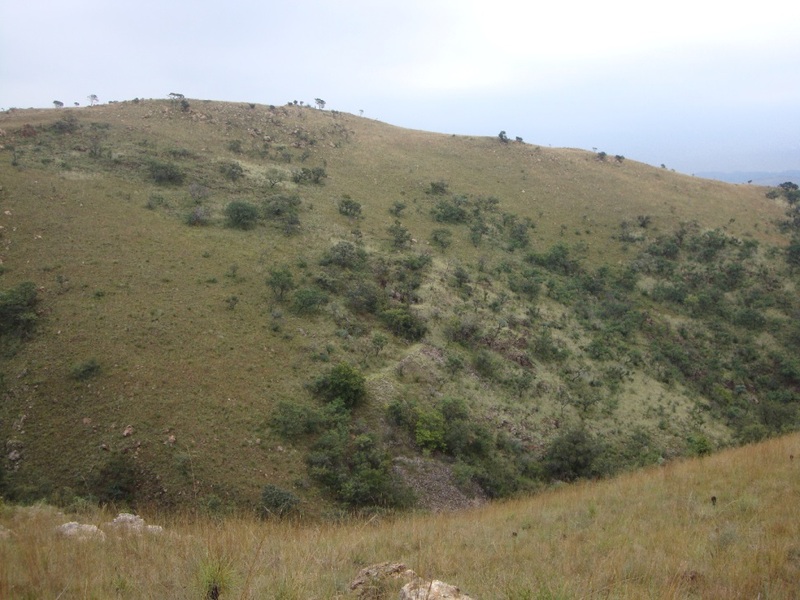 Reassessment of Cercopithecoides haasgati and the evidence for multiple fossil colobine species at Haasgat, Cradle of Humankind, South Africa. Submitted 07/2014, Journal of Human Evolution. Herries AIR, Kappen P, Kegley A, Paterson D, Howard D, de Jonge M, Potze S, and Adams JW. 2014. Palaeomagnetic and synchrotron analysis of >1.95 Ma fossil-bearing palaeokarst at Haasgat, South Africa. South African Journal of Science 110; Issue 3/4:12pp. Adams JW, Kegley ADT, and Krigbaum J. 2013. New faunal stable carbon isotope data from the Haasgat HGD fossil assemblage, South Africa, including the first reported values for Papio angusticeps and Cercopithecoides haasgati. Journal of Human Evolution 64: 693-698. Specimens from the Haasgat HGD assemblage described in Adams (2012). A partial maxilla of the extinct Bond’s gazelle Antidorcas bondi. Specimens from the Haasgat HGD assemblage described in Adams (2012). A partial cranium of an extinct klipspringer, Oreotragus sp. Specimens from the Haasgat HGD assemblage described in Adams (2012). 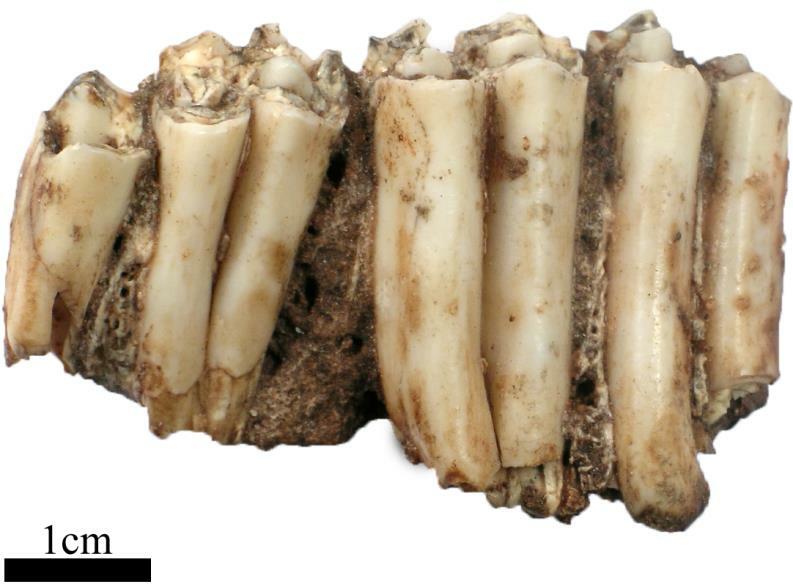 A fourth metatarsal of the extinct false sabretooth cat Dinofelis sp. 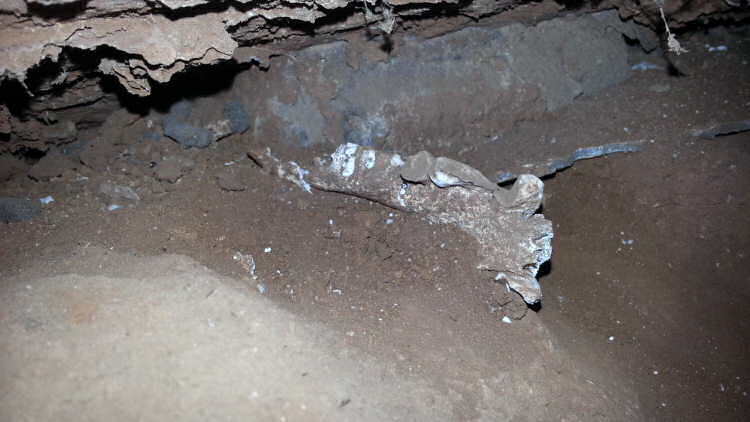 Baboon Mandible: An in situ baboon mandible (Papio angusticeps) discovered during our first excavations funded by the Leakey Foundation.